The Intersections & Beyond: TV5's hit soap "Babaeng Hampaslupa"
TV5's hit soap "Babaeng Hampaslupa"
Babaeng Hampaslupa (The Hapless Woman) is a soap opera that is creating raves aired in the Philippines by TV5 network. The show is on its primetime after Will Time, Big Time previously. 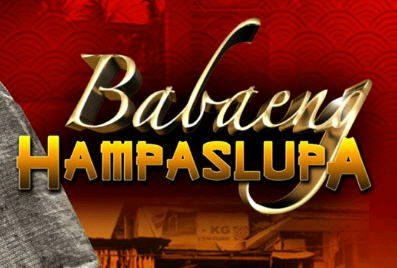 But the timeslot has just been changed, you can catch Babaeng Hampaslupa after Bangis, around 930pm. It starred by Susan Roces along with Alice Dixson and Alex Gonzaga and is directed by Eric Quizon and Joyce Bernal. But amidst the glory, the three women must fight off the new forces around them in their community, the glory they will receive will be a reward to unlock the hatred and secrets and lies of people who have entered and left their lives and secretly their paths will unfold the secrets of their true identities and their pasts. Babaeng Hampaslupa tells the story of two clans: Wong and See. It is a modern day fairytale set on the boundaries between the Filipino and Chinese communities. Three generations of women tell a story and cope with the inner strength in the eyes of their faiths looking for Love, Respect, Power, and Happiness. The story also chronicles on lost loves between Helena See (Susan Roces) and George Wong (Freddie Webb) and the powerful manipulative Edward Wong (Eddie Garcia), the powerful love between Anastacia See/ Diana Wong (Alice Dixson) and Charles Wong (Jay Manalo) and the Vindictive Katarina Mansasala/Wong (Bing Loyzaga) Charles' manipulative wife turned ex and Harry Bautista (Wendell Ramos) the newfound love in Anastacia/Diana's life. And the eternal love between Grace/Elizabeth (Alex Gonzaga) whose life eternally unfolds in her fate, as she will first time learn betrayal and love between Renato (Alwyn Uytingco) and Andrew (Mart Escudero). But between all their trials and tribulations they will have to face, who will they truly love and who will truimph?